It essentially uses the light available underwater and reflects it into a color more visible to fish. Recently, I have been experimenting with Loon’s Fluorescing UV Clear Fly Finish. 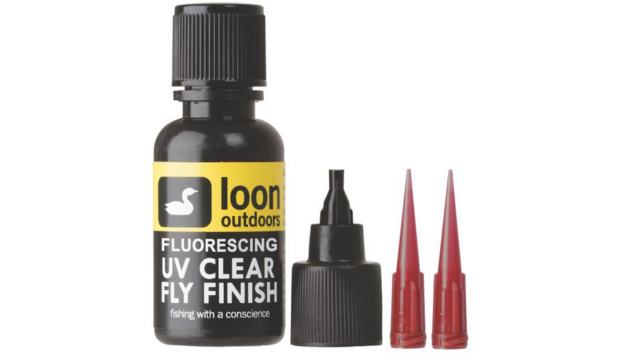 Over the years, I have used Loon Outdoors UV resins with excellent and consistent results. By my own account and that of the many expert tyers I know, it works extremely well. Useful in a number of applications the Loon product has become a dependable staple for a lot of us. So I was excited to see what could be added to the equation to possibly improve the product. 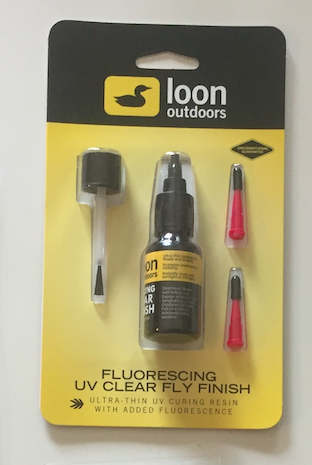 Loon has now created a product that can be worked just as their UV Clear Finish Flow resin is, but in this case they have impregnated the resin with a sort of reflective material. It essentially uses the light available underwater and reflects it into a color more visible to fish. So it has applications for tying flies intended to be fished deeper or in water that is muddy, tannic, or less than clear. We have used this product for a variety of applications with great results. Our experimentation with Loon’s fluorescing fly finish includes a myriad of patterns. Those include green caddis larvae, Czech nymphs, scuds, spoon flies, rain bait imitations, and streamer heads. It worked well for all of these applications. The quality products coming from them of late are impressive. Be sure to check out their full line of products at your local fly shop, at the Fly fishing Shows or at the Loon Outdoors Website. Read more Loon reviews from Fly Life Magazine and stay tuned for forthcoming reviews and releases from Loon.